Ah, the rainy day engagement session. I always have my umbrella with me, because it’s my preferred lighting modifier. Usually, however, I hope that my couple’s don’t have to bring their umbrellas to the shoot. Some days the weather just doesn’t cooperate. So, should you cancel the shoot and wait for a better day? Or should you embrace the elements and go for it, the rainy day engagement session. I am a big fan of extreme weather because it always leads to heightened emotions and more drama. Aditi and Ishan were brave and hardy enough to take the plunge. So I donned my rain gear, we popped open the umbrellas, and went to play in the puddles. Using some of my favorite flash techniques, we achieved this dramatic shot. 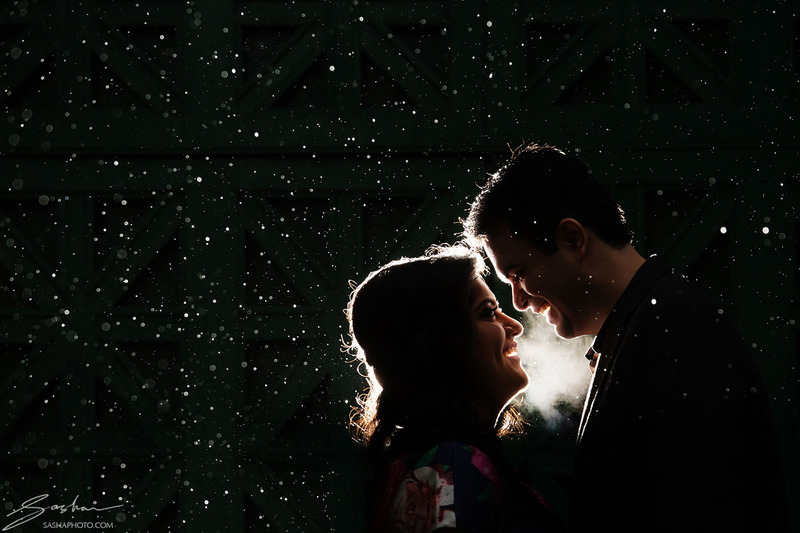 One thing I was really happy about, and what I think makes this shot unique, is how the light illuminated the couple’s breath. The rain drops almost look like snowflakes or dust particles, like the kinds that are found in the “Upside Down” in Stranger Things. In order to get this shot just right, it was important to position my off-camera flashes behind the couple, so that their light would create a halo effect of “rim light” around the couples heads. The same light permeated the rain drops and the vapor from the couple’s breath, freezing it all in mid air. The other part of the shot is to make sure to keep the shutter speed as high as possible in order to darken the background. And of course the couple’s expressions are the ultimate key to the shot. There’s no photo without the spontaneous emotion and perfect connection. I’m very grateful to Aditi and Ishan for braving the weather. It was worth it!